Kalinago English: Online ESL teaching - how to get started? Do you have any advice on how one gets started offering virtual ESL lessons? Before answering, I thought I'd turn it over to you as I can think of several ongoing training sessions she could participate in to get her skills up to speed and will be sending this link (courses at the bottom) - however I reckon she's also asking about finding students and keeping them actively learning, motivated and.... (me putting words into her email of course) probably how to do this in a way that also brings in a reasonable income. So if you're a successful online English trainer (or even a company that deals with this sort of thing), whether it's via Skype, 2nd Life or any other platform - would you like to share with us your best tips, helpful links, book suggestions, good/bad experience and things to watch out for - so that we can become better informed? A good way to get started would be to join one of the many language exchange sites such as Live Mocha http://www.livemocha.com/ then you can get used to being and online learner at the same time as being a teacher and it is also very low commitment, so if you don't like it you just stop doing it. You might consider joining a community like MyEC, where there are thousands of English learners needing English help online. This is a good place to practise using blogs, chat rooms, video quizzes, games, and other online tools for challenging, testing, and encouraging learners. You can also make some connections with learners who may be interested in your virtual lessons once you get them going. Nicky Hockly is an author and teacher trainer who has been doing stuff online for ages. Her blog is www.emoderationskills.com and she has a book coming out this year on Teaching Online (from DELTA). I know this doesn't answer your question immediately but in medium to long term it's worth getting a hold of. Great post and good idea Karenne to open it up to the community. As far as I could figure, Suzanne was looking for online employers / ways to teach online, rather than teaching skills such as the (great) Consultants-E offer. Skype ,the well-known VOIP free phonecall website, used to offer a cool little marketplace, where you could sell your online time for lessons and stuff, but unfortunately they closed it down a while ago. There are also sites like Linkua that allow teachers and potential paying students to link up. I've not used it, and to be honest it looks ever so slightly dodgy, but it might be a nice way to start out and see if you like it. Then you could go on to opening up your own online school a bit like the guy from UK Teachers Online has done a pretty good job of doing. IMHO, I'd get good at what you do first, then think about opening an online school sometime into the future so that Suzanne doesn't make any mistakes with her lessons that damage her online rep.
Once she's done that, look for something like a Moodle online classroom and someone that can help her set it up and get all her materials into it and ready to teach with. Good luck anyhow Suzanne. Teaching online isn't an easy job (or at least is no easier than teaching face to face is.) It holds its own unique challenges, too. It does allow you the freedom to teach from the place you choose, from one country to another and potentially offers you a fairly limitless marketplace if you do it right and word of your skills spread. Some random tips for teaching online - assuming you've gone through your training, have students, and are ready to go! - prepare materials which are quick to load. You might have great bandwidth, but your student might not. Minimise graphics etc. Not a professional but I do have some experience as an amateur who could be professional/commercial if that counts. here are some more random thoughts. The freelance approach is possible but it is heavy maintenance. You need teaching skills, ICT skills, SEO skills and marketing skills. And time - lots of it. You need a shop window to start off with: thinking blog as a good start. You need people to find you - be careful how you brand yourself. Choose something unique-ish but still generic. Your own name is a good start joined with the name of the field: eg Ahmed's Toefl Blog. Don't be put off by the word blog. Blogger is getting better, but Wordpress offers so much more flexibility. The CMS type platform has loads of potential for a "commercial" EFL site. It's a crowded market. Go for a niche. Don't be afraid to give stuff away. It's the Tesco bog off principle. You need experience. Start off with "real" students before you graduate to virtual students. There's an awful lot of free out there. You need to add value to the free stuff: Skype I see mentioned, I'd go for Wiziq or Dimdim - both are neat, but dorequire a tooled up student. Have a look at the Wiziq site. There are teachers giving lessons away for free. That would be an excellent training ground. Do it enough, build your cred and get some testimonials. Finally: network and research. Go find forums. See what people want. The best general english one for me is Using English - you can learn an awful lot there. Yup I did the consultantse course and I can recommend it. Just read my comment. One final piece of advice:if you do try the self-publishing route, it helps to proofread before you publish. Whoops. A great question and great tips by the very providers of teacher training in this area language learning with technology. All names have been mentioned. When you look at these lists though, one thing really strikes me. Something that has puzzled me for years. Why are there so few of us? Which organisations are usually the ones who provide teacher training for language teachers? Isn't it the publishers and Universities? Take the publishers for example, don't they conduct the majority of presentations at conferences, the majority of workshop and events all focused on pedagogical training for the language teachers and all usually for free so that they win you as a loyal client promoting their books with your learners. Why do they not offer courses on how to use a wiki or how to work with moodle? Why do they not teach how to use blogs in class? Do they offer courses where to find authentic teaching material and how to create webquests or games? 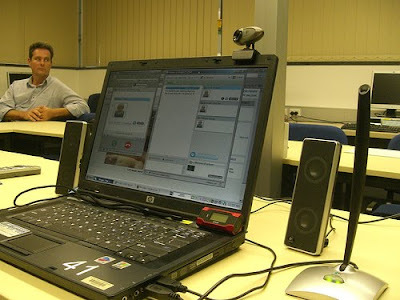 How to use virtual classrooms or virtual worlds? How to collaborate online? And then how about the universities and teacher training colleges. CELTA, DELTA, TKT - but where is the 'CELTA' in ICT of our times? And what about the majority of the pedagogical colleges where language teachers graduate by the 10s of thousands in Europe? Do they leave their colleges and are these young teachers able to use technology in class? Isn't this puzzling? Does anybody have any ideas why this so? BTW, for Suzie: EVO sessions are a free 6-week teacher training camp for language teaching and learning with technology. They start mid Jan and go till end of Feb. There is still time to join. Interesting post and I think a very relevant one, on a topic/movement I personally expect to explode a lot more this year. With the variety of Web 2.0 interactive tools available now, it's not actually that hard to get set up to teach online, and you don't need to be a tech wiz. If you already have a lot of teaching experience and can handle the basic tech, it's not even actually necessary to seek out a certification or training course. The wonderful thing about it is that there are rich opportunities to experiment and learn on the go. 4. Online learners are different from regular school/institute-enrolling ones in some unique ways. For one, they tend to rely less on a "brand" when looking for online teachers and more in the way of actual evidence. By evidence, I mean trackable testimonials from other students, and examples of lessons featuring the teacher doing his/her thing. If you've applied some of the points above, you'll have started out not immediately chasing income, and this will hopefully build up the testimonials and examples sides of things, which are important prerequisites to actually selling an online teaching course, service or product. For me, building a viable online teaching business involved (a) 10 years experience building specific specialisation with a particular set of important English exams, and (b) 5 years of patient experimenting and building before launching genuine pay-for services. Others may go about things more quickly, especially if they're willing to plug in to some of the "online teaching malls" about and pay some sort of commission to end up in places where students can find them. Personally, I like having no "middle men" involved. I keep all of my own income, and it allows me to control and keep my services remarkably cheap for my students. Many avenues to get to online teaching, and it's a developing field. Exciting! Thanks for posing a useful question Suzie (and Karenne). I also get asked this question on a regular basis (and hence the upcoming book about Teaching Online, mentioned in Lindsay's comment above!). 1 Ensure that your ICT skills are up to scratch. Get training if necessary (lots of potential sources of training mentioned in the comments above). 2 Start small. Best to start with a face-to-face class you already teach, and to integrate a little bit of online work into the syllabus. For example, offer 80% of the course f2f as usual, and start to experiment by offering 20%of the course online (and here is where your brushed up ICT skills come in handy, as you have a range of options and tools to choose from). Steps 1 and 2 can in fact be taken more or less at the same time. WOW!!! I am so grateful to all of you--and especially kareene, of course--for sharing your expertise so willingly. please know that each of you has helped move my life from "downsized" to "globalized". i'm chomping at the bit to click, click. click my way into my future! i'd love to follow all of you, be it twitter, facebook or linkedin. i'm susiedec4, susie sullivan, suzanne sullivan respectively. happy trails to all. Two things occur to me here. The first sounds facile but is even more important than you might think. You have to be unbelievably comfortable with the technology you use. You need to know every back door, every hack and every alternative way to operate your chosen technology. On the face of it, systems like dimdim are fairly easy to operate, but the simplest things can go wrong (people using Mac Books occasionally get a 5 second echo in sound) Things like that can cost you money and more importantly, your reputation. You are going to have to teach technological idiots how to use your tools and then accept that they are in an environment that is very foreign to them. that puts a lot of pressure on you. The second point is that pure elearning solutions are still relatively rare and customers who are willing to pay top dollar for your time are thin on the ground. It might be a good idea to look at blended learning as an option. It can solve some of the technology learning issues and there are a lot of people who are willing to pay good money for a well thought out blended learning concept. Apart from that you will soon discover that your customers do their online work at very strange times. If you want to keep the service standards high, that means weekends and evening are not as free as a partner might wish. Having said all that, I love the challenge of online teaching and wish you all the best in your endeavours. Educational videos, online tutoring and online text books seem to be increasing in popularity. It’s cheaper and you can also focus to a particular subject to study rather than taking the whole curriculum. The concept is viable..
Suzie, If you are planning to make your own educational videos and earn from it at the same time, don’t miss this great opportunity - Teach Online. I hope you don’t mind me re-posting one of my blog posts for people interested in becoming a freelance online English teacher but don’t know where to start. What do I need to teach English online? While some online English teaching companies have a software especially designed for their needs, you can use instant messaging (IM) applications as your primary aid in teaching online. Yahoo Messenger, MSN Messenger, and Skype are just some of the many free applications that have features that can help you deliver whatever learning you want to impart. If you do not have any of those applications, download and install them now. Aside from an IM application, you will need a good headset. Your hands will be busy typing or clicking a file to share with the student, and the headset provides you with the functionality of a telephone handset with hands-free operation. You will also need a good webcam. Understand that you can buy a functional webcam for less than $20, but if you want good results, go for the ones with extra features and good resolution. Although they may cost more than $50, these better webcams are a good investment. Since your class is an online English class, make sure that your internet speed is fast enough, at least 1 Mbps. As for textbooks, you may or may not need them depending on the following: the type of class you want to conduct, the approach you want to employ, the level of your student, and the nationality of your student. For instance, if you want your English classes to be CLT-based, a textbook is not (always) necessary. If your students are Koreans, you might want to give them a textbook they can study. TIP: You don’t have to buy a textbook. There are tons of good e-books on the internet. Last, you will need to consider how you will be paid, so you need at least one payment option. The usual payment options are via three modes: money transfer, wire transfer, or online payment transfer. In money transfer, students are given the option to pay through Western Union or other establishments offering the same service. In wire transfer, your salary is deposited into your bank account. In online payment transfer, students pay via Paypal, Alertpay, Liberty Reserve, or Neteller. The last option is highly recommended because it is fast, safe, and convenient. If you plan to have this as one of your options, you need to register with these companies. So if you have access to the internet and a good computer, you can teach or learn English online anywhere. Anywhere can be your virtual classroom. To summarize, here are what you need to start teaching English online. It looks into the advantages and the pitfalls, as well as provides 5 questions to ask yourself before getting into online teaching. Hope you find it useful! A little late to the discussion but I would like to add my thoughts and talk about my experience of teaching online. There are different websites out there that where you can post your profile, set your price, and hope that students sign up with you. The biggest problem with going down that route is that there is a huge supply of English teachers and price competition comes into play. 1. A website - not a blog or a free site, but an original domain name and design. This is much easier than people think. 2. Tools - Skype, paypal, some other small things too. 3. Students - Getting students is pretty straightforward when you know where to look. Being independent, finding your own niche, and setting up your own business is so much more rewarding and beneficial in the long run. Thanks for these excellent tips everyone. I too am interested in teaching ESL lessons. I have two years of experience teaching online for a big company and my question is how can I find my own students. I will follow the advice of setting up my own website (not a blog or a free site) but please tell us specifically how to attract students. Thanks to all for the tips.